Ark Fortress gate in Bukhara. Right: All hail the king... Locals are used to welcoming Silk Road travellers. Peering through a gate at hundreds of cavorting people I’m beckoned inside by a thick-set man whose radiant smile belies the frown etched across his forehead. This is an Islamic festival I’m told, culminating in 1,200 people celebrating the circumcision of the police chief’s seven-year-old son. Roasted lamb, stuffed peppers and piles of fresh fruit; each table contains a king’s banquet, continuously refilled by an army of attentive waiters. The role of a second army of febrile workers is to ensure each table is suitably stocked with vodka. But is this an Islamic festival? Being celebrated with inexhaustible toasts to Uzbekistan, to Samarkand, to friendship, to this, to that? Stretching from eastern China to Istanbul and Cairo, the Silk Road became the greatest trade route of all time. Silk, slaves, saffron and precious stones… before the advent of European colonisation and cargo ships, this was the place to haggle in a foreign language and return with goods to impress your friends. Empires rose and fell over the centuries: the Mongols, Persians, Chinese and Romans, each earning their fame and ensuring the never-ending reverence of their brutal leaders (George W. Bush won’t be remembered as fanatically as Gengis Khan). At the heart of it all was Uzbekistan. Straddling eastern and western empires, its location ensured the riches of being a consistent trading point but also resulted in it being sacked by many a marauding army. 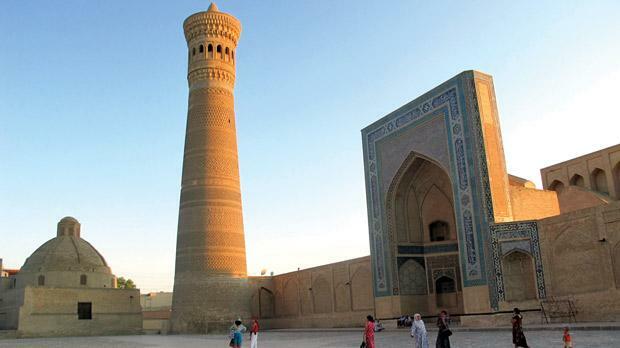 Bukhara satisfies the quintessential preconceptions of ancient Silk Road life; winding alleys of yellow stone houses and grand mosques suddenly appearing after hundreds of miles of desolate, inhospitable desert. Following me on my journey is the ubiquitous sand which sweeps in and rests on the steps to a 16th century mosque. People still live in these alleys, in elaborate traditional houses built in Bukhara’s heyday. With open courtyards, wooden ceiling beams and ornately decorated doors, many have been turned into simple but beautiful caravanseri guesthouses where I’m able to sample the charismatic simplicity of ancient life. Ruling his caravanseri with decorum is Mubinjan, a grey-haired oddball who sprinted for the USSR in the 1972 Olympics and wears his ragged tracksuit bottoms with pride. Like Bukhara he's characterised by a charismatic but quiet atmosphere mixed with more than a hint of aging aesthetic beauty. The ancient stone madrassas and mosques that fill the hushed streets no longer function, but they still carry an air of understated grandeur that impresses even the most travel-tired eyes; crumbling large stone archways, geometric domed ceilings that defy art, and a soaring tilting minaret, all attracting unerring stares. I change money on the black market, each dollar and euro returning 40 per cent more Uzbek som than the government banks and their official rates. After watching the scene intently from the shadows, a policeman approaches as I hand over my cash. Trouble? Not at all. He politely inquires about the rate and tells me he can beat it. Everyone in Uzbekistan is part of the black market, perpetually inflating the rates and ensuring most tourist income ends up being laundered and stored abroad. The problem isn’t changing money, it’s figuring out how to store it. One euro equals 3,300 som, yet the biggest note in circulation is 1,000 som – the price of a large bottle of water. Too big for a wallet or pocket, I opt for a black plastic bag and look decidedly like a runner for Don Corleone. With my fake wealth I head to Samarkand, after, or course, lying on the bed and hurling the notes around the room Hollywood style. In the centre lies the Registan, a sublime collection of madrassas, two built in the 17th century and one built in the 14th century, their blue and turquoise tiles shimmering in a sun that illuminates every intricate detail. Everything is obtainable at a price in Uzbekistan, and a little baksheesh (bribe) brings unparalleled access to these unique buildings. Slipping the policeman $5, he leads me up the rickety spiral staircase on ‘police business’ to the top of the illustrious minaret for incredible views of the azure domes and arches that have made Samarkand synonymous with the wonders of the Silk Road. From my pedestal, every building leans at an incongruous angle, the sort that makes Pisa appear architecturally perfect. The front arches are a trick of the eye; by leaning forward they give the impression that they’re taller than they really are. From my illustrious position I attempt to influence the masses with my very own attempt at a call to prayer (a football terrace anthem, naturally) but I'm drowned out by the distinctive sound of Uzbek pop music that pounds through the air. An idiosyncratic blend of traditional singing with the cheesy backbeat of Russian dance music, it more than tampers with the tranquility I was trying to destroy and its source deserves a closer look. As I peer through the gate the jovial Sarvor invites me inside and talks me through the crowd, introducing me to everyone with a cordial sincerity. Most tables at this elaborate celebration are police related and it seems logical that in a country with inherent corruption they would be the people able to afford such an extravagant party. Kids dressed as pantomime horses or beautiful women in long flamboyant saris, there’s a choice of people to pay to be my dancing partner to the joyful music. But throughout the exuberant boogieing men are kept curiously separate from all other women, an element of Islamic culture perhaps, which culminates in 20 men performing a tag team dance with one feverish woman who laps up the unremitting tips. Uzbekistan peculiarly blends the seemingly incomparable cultures of Islam, Russia and nomadic life. It makes vehement attitudes hard to find as rules and traditions are bent to pacify everyone and ensure a culture that works. Fortunately the Uzbeks haven’t adopted the stereotypical Russian sternness and have maintained a heartwarming tribal benevolence that makes me feel comfortable despite being an uninvited guest at this party. Alcoholic Muslims, women who swap their traditionally demure dresses for miniskirts at sundown, and charming alleyways littered with ugly overland gas pipes, are just some of the paradoxes this cultural volcano has emitted. The party provides an alternative perspective on Uzbekistan, one that can’t be found in the imposing architecture, and one that brings to the surface these paradoxes that can make Uzbekistan a fascinating place to visit. But as the days pass I realise I’m being tricked by an impressive facade designed to prevent foreigners from exploring deeper beyond Uzbekistan’s infamous Silk Road sites. Foreigners must have a hotel registration for every night they spend – preventing home stays with families – and 10-metre walls have been erected to hide the interesting backstreets that surround the main tourist sites. Fortunately, thanks to Sarvor’s invitation, I had an opportunity to get an alternative glimpse into Uzbek life. By restricting and controlling what tourists can access, Uzbekistan has successfully preserved its Silk Road image. And what an image. 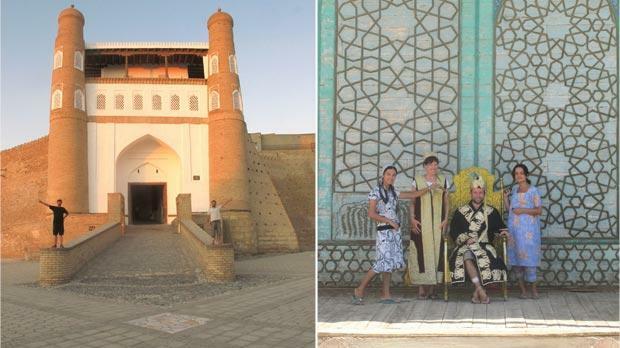 At first I dismissed the eccentricities and corruption as laughable quirks as my brain struggled to comprehend the beauty of the buildings: Uzbekistan truly has one of the most impressive collections of ancient buildings you could ever wish to see. But how relevant is the Silk Road in the 21st century? How redundant are Islamic values in their modern culture? What about a thriving black market, hiding local communities from view? Is it all the incompetence of a paranoid aging president or something more sinister? Uzbekistan throws up such questions and makes me realise that all is not quite as it seems.